.. when the earth shook again and again, I was afraid. And sometimes I cried, because I missed Manman and Papa and my little sister, Justine. But in my mind, I played. 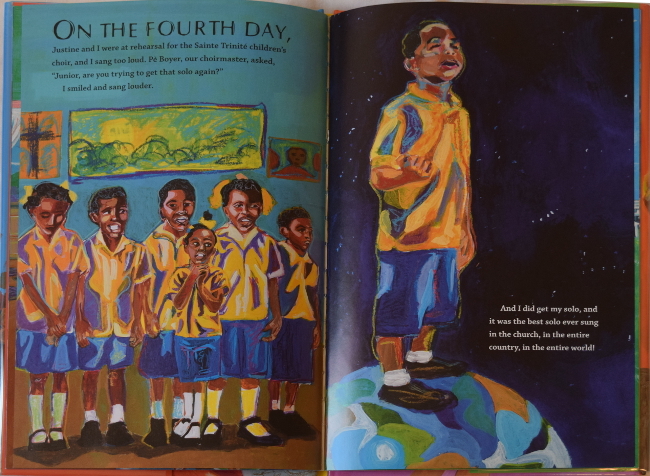 Haiti’s 2010 earthquake didn’t end happily ever after, yet it’s the subject of an inspiring picture book. In Eight Days: A Story of Haiti, author Edwidge Danticat introduces us to Haitian daily life through Junior, a fictional boy pulled from the rubble after eight long days. As we wait for Junior’s rescue, day by day, the story focuses on pre-earthquake Haiti. We daydream with Junior about his favorite, wonderfully ordinary activities—flying kites, eating sweet mangos, and helping Papa sweep up at work. Through his eyes, we feel the simple joy of jumping in puddles, racing bicycles around statues, and singing in the church choir. 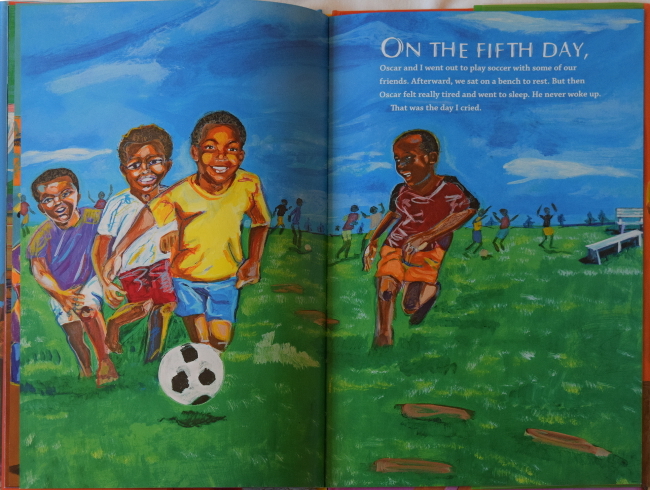 The text resonates with a child’s voice and word choices, letting us peek into a far-away culture full of light and joy despite unimaginable challenges. The next time you’re feeling overwhelmed or troubled, read Eight Days for a dose of hope, happiness, and humility. How often does news of natural disaster cause a knot in your stomach and a lump in your throat? Do you wonder how such global challenges affect children? Can you comprehend the anxiety felt by child survivors, like the Haitian children who worried for their families and loved ones after the January 12, 2010 earthquake? 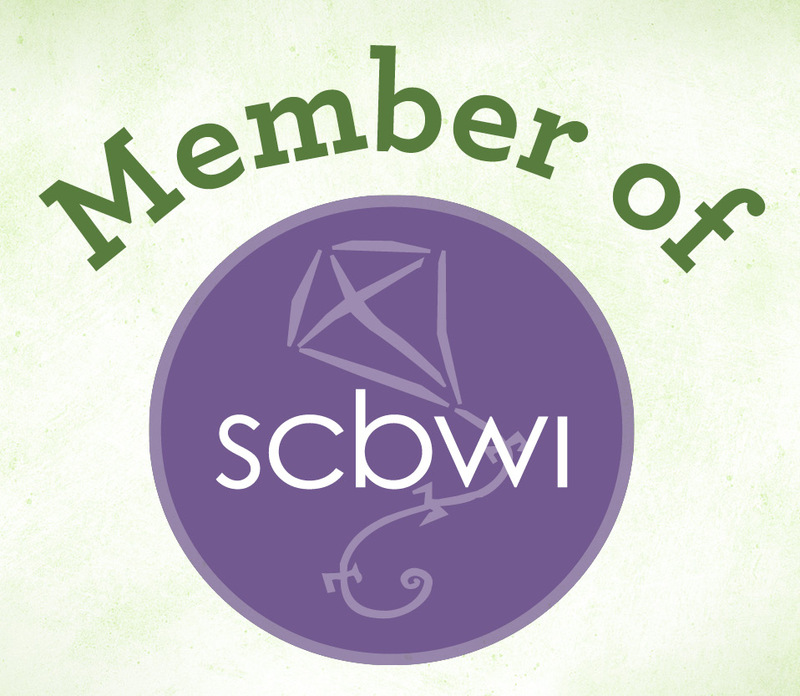 Edwidge Danticat could. Her own five-year-old had questions. Danticat wanted her daughter and other children to know that hope, memories, and imagination can survive disaster. That’s why she wrote Eight Days: A Story of Haiti. Danticat wrote about struggle, determination, and loss through a small survivor named Junior. 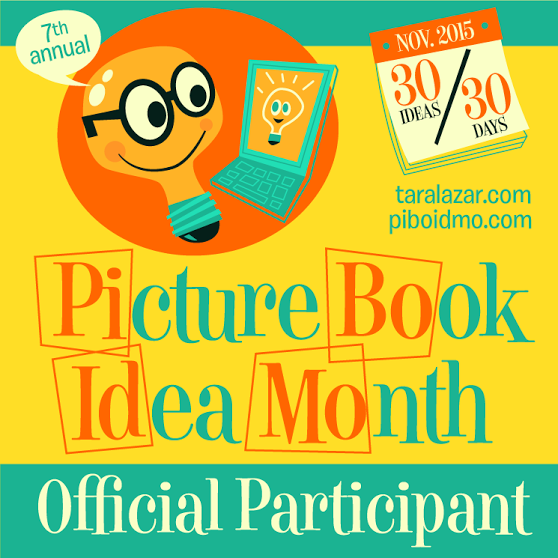 Through this creative format, kids can understand and accept, without feeling overwhelmed by sadness or despair. 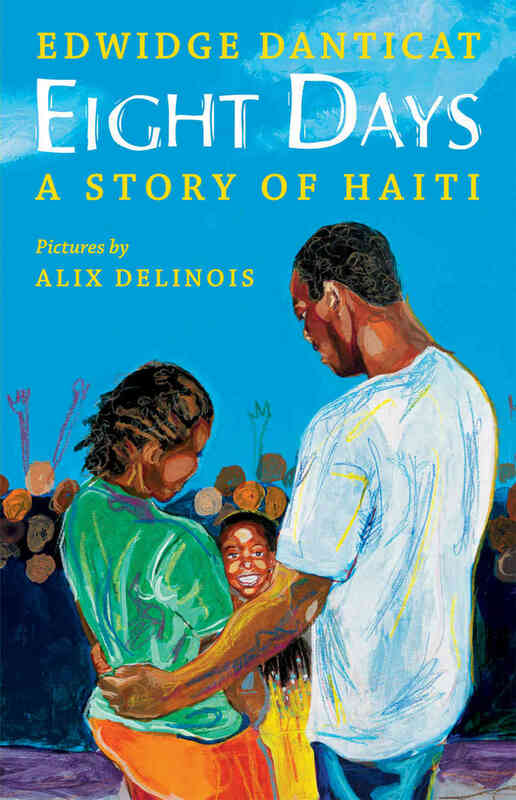 Alix Delinois’ beautiful, bright, colorful illustrations keep Haiti and its culture alive as it was and can be again. 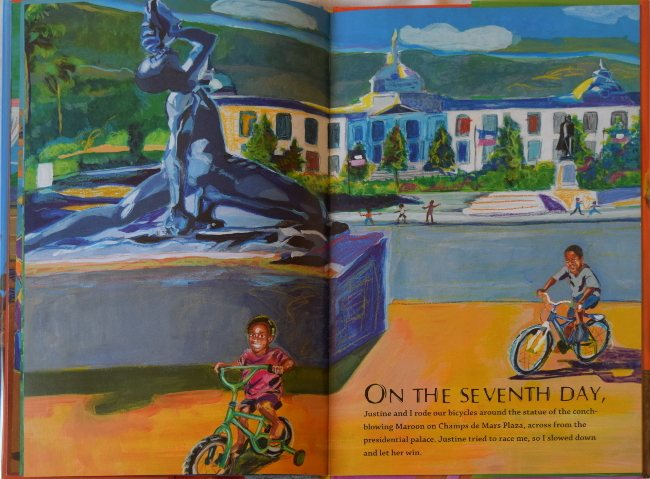 Power in a picture book: If you want to assure children or yourself that it’s okay to talk about sad things–and that perseverance, empathy, and compassion can overcome tragic circumstances, look no further than Eight Days: A Story of Haiti. Watch for my gem next! 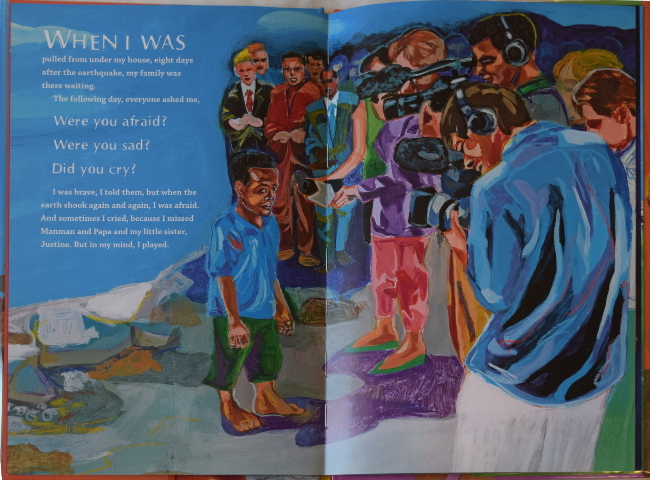 What’s you favorite survivor story for children?